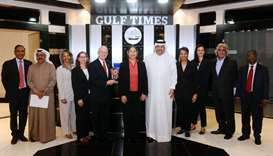 Qatar and the US continue to share strong and growing relations in many sectors, especially in the fields of energy, defence and education, a round table discussion attended by US and Qatar participants has agreed. HE the Deputy Prime Minister and Minister of State for Defense Affairs Dr Khalid bin Mohamed al-Attiyah met on Sunday with French Minister of the Armed Forces Florence Parly. 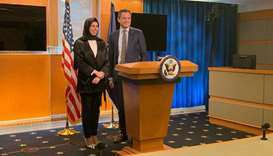 HE Minister of State for Foreign Affairs Sultan bin Saad al-Muraikhi met the Senior Vice-President for Middle East and Turkey Affairs at the US Chamber of Commerce, Khush Choksy, who is currently vising Qatar. His Highness the Amir Sheikh Tamim bin Hamad al-Thani arrived in Zagreb on Sunday evening on a two-day state visit to the Republic of Croatia. 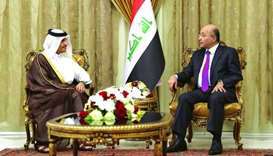 Iraqi President Barham Salih met HE the Deputy Prime Minister and Minister of Foreign Affairs Sheikh Mohamed bin Abdulrahman al-Thani in Baghdad on Wednesday. 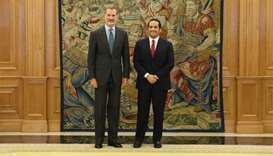 HE the Foreign Minister conveyed the greetings of the Amir to the King. His Highness the Amir met with the Mayor of Berlin Michael Muller during a visit paid by the Amir to the Berlin Municipality on Thursday evening. They discussed bilateral relations and ways of developing them, as well as enhancing the prospects for co-operation.